Hurricane Irene, which hit the Abaco Islands a few days ago, had many people wondering about the fate of the critically endangered Abaco Barbs. The good news is that the three mares that are kept on the preserve are apparently fine. To my knowledge nothing is known about the fate of the stallions, but that has been true for a long time. There are at most two, and they are not kept on the preserve with the mares. The last sighting was of the 22 year-old stallion Hadar, made in February of this year. The second stallion, the splash overo Capella (made famous by Breyer), has only been sighted twice in the last five years. A flyover of the island in 2010 did not turn him up. From a color perspective, the splash overo pattern is still there by the slimmest of margins. If Capella, a homozygous splash, is still alive, then the prospect of preserving the pattern are much better. If not, probably the only source is the heterozygous splash mare Nunki. She looks very typical of splash carriers in breeds without sabino. The other two mares, Acamar and her daughter Alnitak, are plain bays. Acamar does have a star, and some splash carriers are pretty cryptic, but it would be slim hope were she the only one. Acamar and Alnitak do have frosty roaning in their coats, but it is not as pronounced as that on a dark-headed roan. So the steps that must be taken now is to find one of the five horses still alive and still able to breed. If that can be done, out-crossing is going to have to take place. If experts are consulted, a preservation program can be created that would utilize animals from genetically similar backgrounds. That kind of research will be the subject of a future post, because it is a wonderful tool not only for preserving livestock diversity, but also for shedding light on the true relationships between the different breeds. 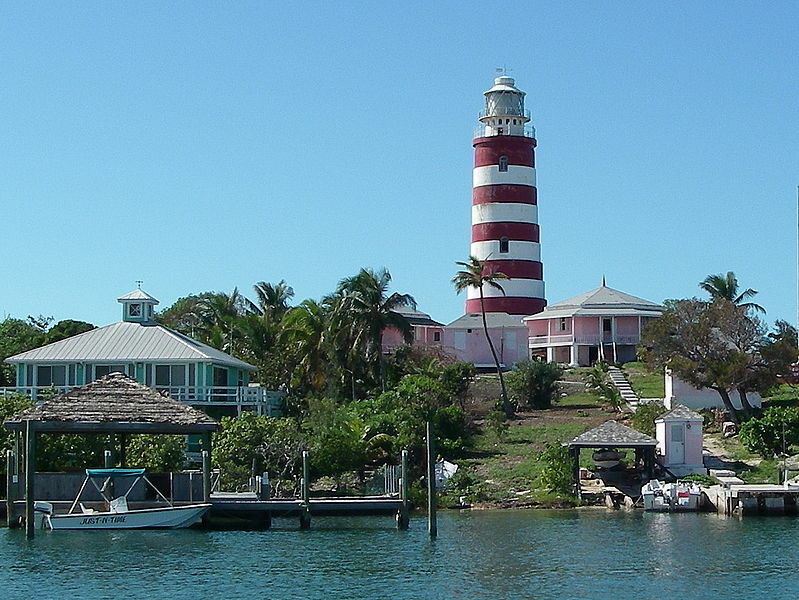 The Barbs on Abaco may well be a cautionary tale – rather than a success story – about preserving genetically distinct populations, but there are many endangered groups where the outlook is more optimistic and there is still time to take action. The conversation over the last few days regarding pintaloosas reminded me that it might be helpful to talk about epistasis. Most people are familiar with the idea of dominance. Dominance describes the relationship between versions (alleles) of the same gene. The gene responsible for greying (G), for instance, is dominant to the one for not greying (g). 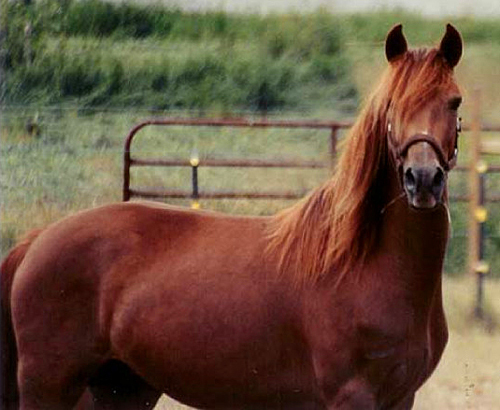 Dominance is often misunderstood to mean prevalent, as in “the dominant color in Morgans is chestnut.” In those cases it is probably a lot less confusing to say a color is predominant in a breed, rather than dominant. All the chestnut Morgans in the world cannot make chestnut a dominant gene! The term dominance is also misused to describe how genes interact with unrelated genes. Grey is again a good example, because it is probably the most common gene spoken of in this way. It is not unusual to hear “grey is dominant to all the other colors.” It is not; grey is only dominant to not-grey. The relationship grey has to the other colors is what is known as epistasis. Epistasis describes the situation where the actions of one gene hide the actions of another unrelated gene. Grey is not dominant to the other colors, but it is epistatic. It eventually hides the colors and patterns the horse has. Chestnut is the very bottom in terms of dominance, because it is recessive to the black-based colors. 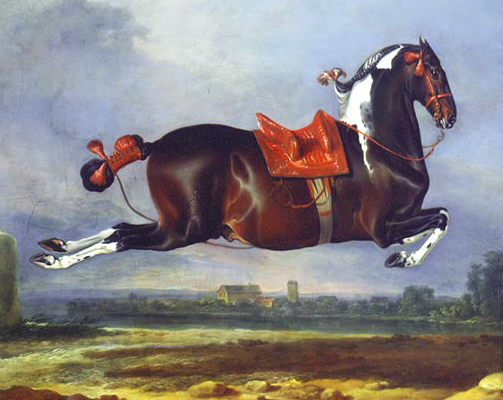 But it is also epistatic, because the gene that controls where the black goes (ie., whether the horse is bay or black) cannot be seen on a chestnut horse. There is no black to show which version a chestnut horse has, so those instructions are hidden. They are, however, still there. That’s why the right chestnut horse, bred to a black horse (recessive to bay), can produce a bay foal. It was carrying the dominant bay gene, hidden by the actions of its recessive red gene. A very similar situation exists with the cream dilution. Just as silver only dilutes black pigment, cream only dilutes red pigment. Here the epistatic color is black, because there is no red pigment to dilute. 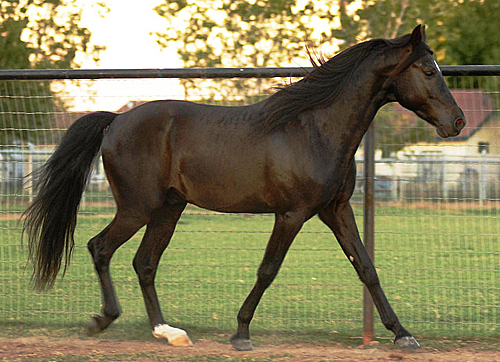 This horse is a black Foxtrotter named Quick Trigger. He carries the cream gene hidden by his black coat. Cream is not hidden because it is recessive, but because the genes that made Trigger black set up a situation where the cream could not be seen. Or perhaps a better statement would be “could not easily be seen”. In many cases epistatic relationships, while they hide the actions of a gene, don’t necessarily make it impossible to see the effects. Sometimes they just make it pretty difficult, or difficult to be sure. Some blacks with the cream gene look more faded than those without it, for instance. Unfortunately for people wanting to identify them visually, though, quite a few blacks without cream fade pretty badly. That is what was happening with the pintaloosas and the grey appaloosas. 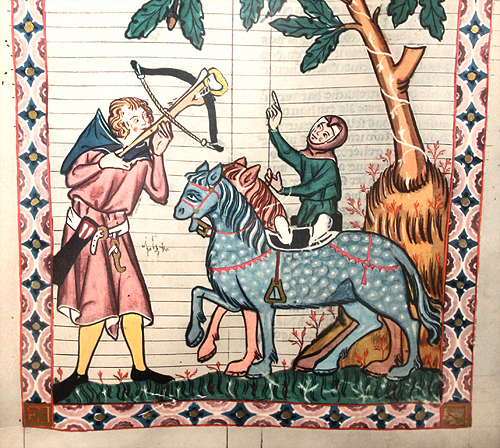 Generally the more white the horse has, the harder the individual patterns are to identify. We can guess, based on what is found in a given breed, and what traits are most typical of this or that pattern, but without tests it can be hard to be sure. 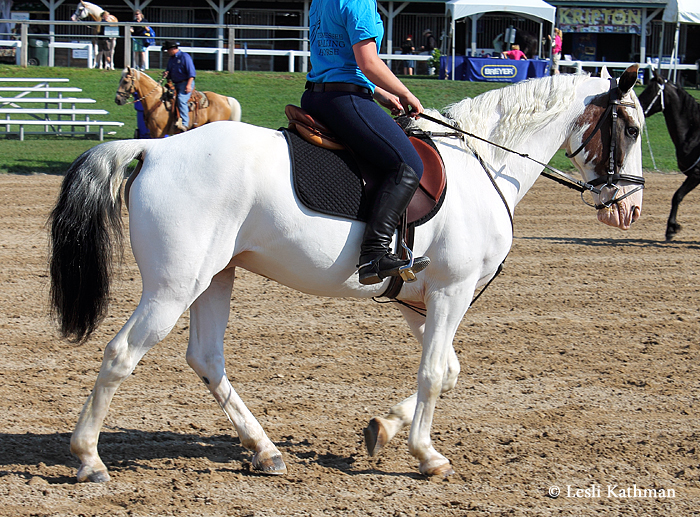 Here are some shots of the horse used in the post to illustrate the difference between cremello and truly white skin. Those were his colored areas, while the rest of him was white. (I was never in a position to get a good shot of his whole body, unfortunately.) He was also a rescue horse, so nothing much was known of his background. You could overlay a typical tobiano pattern on a horse like this and not see it. Does that mean he is a tobiano? Not necessarily, since you can layer mutiple overo patterns and get that much white. There isn’t any way to know without testing. Whenever people breed a lot of different color genes together, things tend to get muddied like this. It often makes for very cool looking horses, like the ones in the last few posts, but it sure can make it hard to be sure what genes they carry. Christine Sutcliffe shared this guy in the comments section of the previous post, and I wanted to post him here where he’ll be more likely to be seen. He carries the tobiano pattern, as did the others, along with varnish roan (leopard complex) and one or more of the overo patterning genes. I say that because he has a broad blaze and two blue eyes. Some greys lose pigment on their faces, which can also confuse the issue. I suspect that is why varnish roan (leopard complex) has remained in some grey breeds (or strains in breeds) even when appaloosa patterns are not considered desirable or are outright banned. If true greys can develop mottled skin with age, then the facial mottling that develops from varnish pattern might not throw up warning flags. 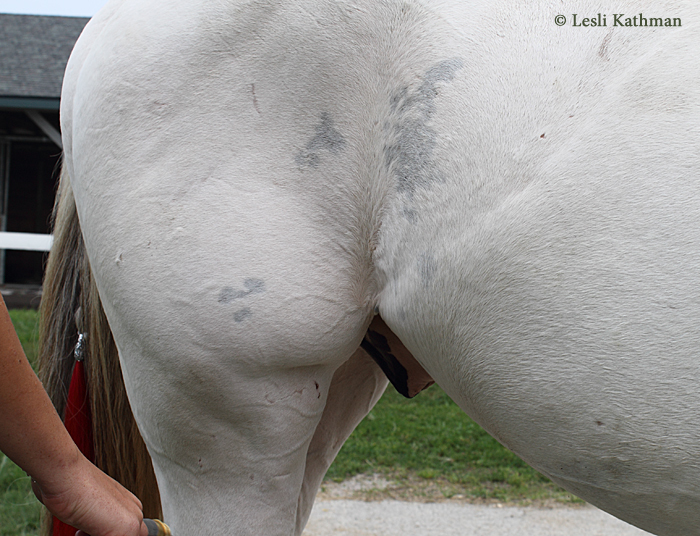 What sets the progressive whitening of varnish roan apart from grey is that it leaves the spots. The dark spots on this fellow’s rump will remain, no matter how much paler his body becomes. It is thought that all appaloosas roan out, sooner or later. That only applies to the body color, though. When grey is added to the mix, it all lightens. The really loud appaloosa Friesian cross Mystic Warrior is a well-known example of this. This link shows his current appearance along with pictures of the loud black leopard he was as a foal. Because grey eventually erases the spots in a way that varnish roan will not, it is often considered undesirable by appaloosa breeders. 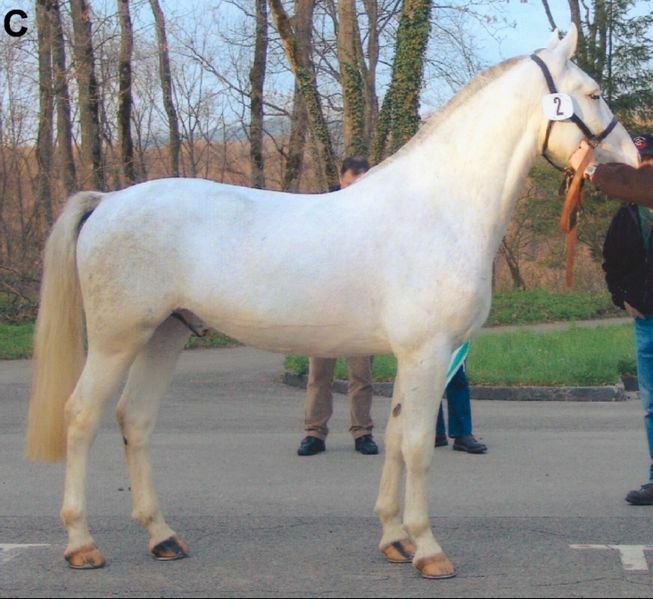 Contrast is often the name of the game in breeding for attractive appaloosa patterns, and grey removes it. That’s also why leopards have traditionally been so sought out by breeders; theirs is the pattern that keeps its contrast. Blanket patterns eventually look a lot more like varnish roans over time. 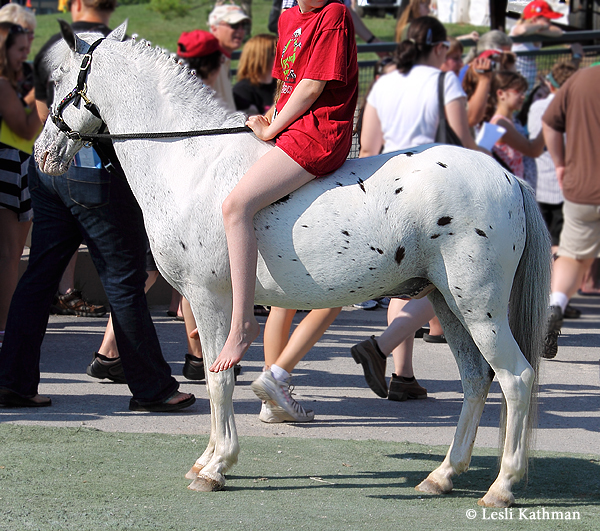 What is interesting about grey and appaloosa, though, is that before it takes the spots away, it tends to skew them. The angled spots on Mystic Warrior show that really well. On appaloosas with dark areas, like those with blanket patterns, it often adds dramatic white spotting that looks like a cross between marbling and dappling. 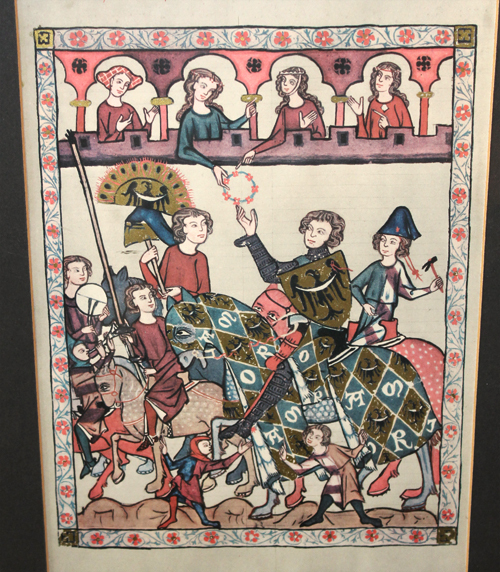 For those that have the most recent edition of the Sponenberg book, there is a part-Arabian with this type of effect. 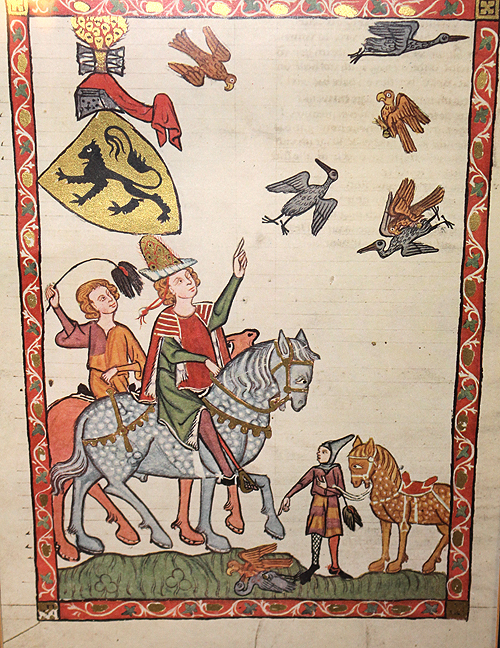 (He is also pictured in the German book Pferde aus Licht und Schatten.) It seems that not all grey appaloosas get altered in these ways, but it is common enough these are good clues that grey is there. When it comes to how the different patterns interact, tobiano could be called the top dog. Pretty much no matter what else it gets paired with, the end result still looks pretty much like a tobiano. 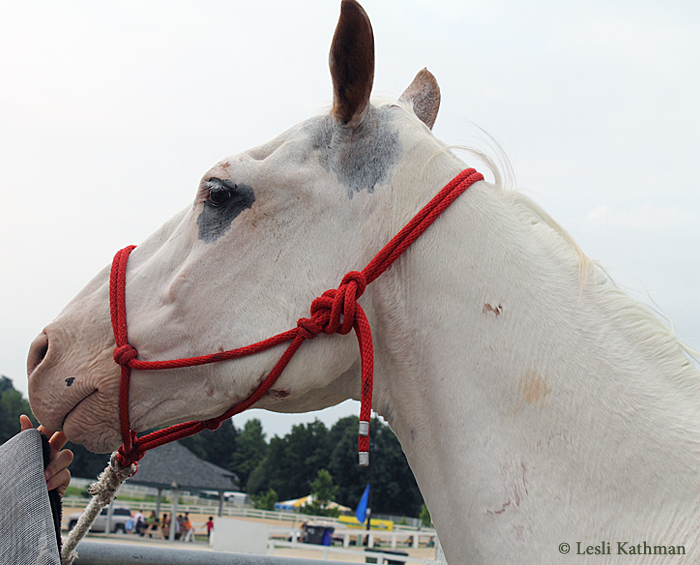 Sometimes the other patterns add new areas of white, like this tovero here with the bald face and white ear, but visually it is still pretty easy to identify the horse as carrying tobiano. 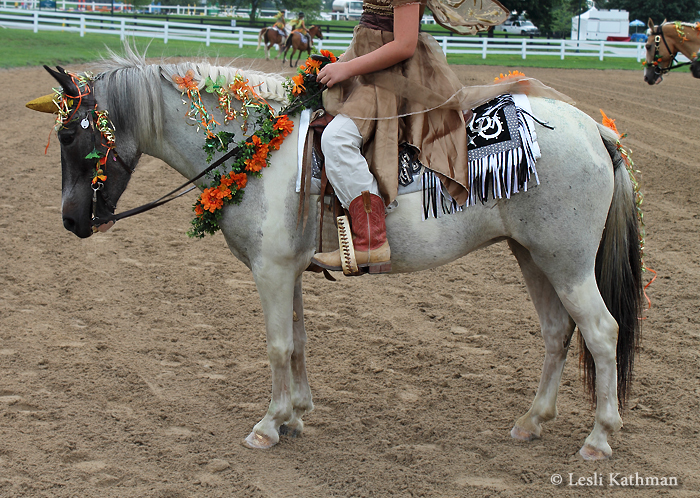 Here is an pony with both the appaloosa and tobiano patterns. Notice how the white areas from the tobiano just overlay the leopard pattern. The lighting for that picture was just right to show the tobiano markings. In bright light, it would be possible to miss it. The outline is also lost as the pattern travels up his hindquarter, when it meets what would likely be the pink-skinned area on a leopard. Here is tobiano overlapping dark-headed frosty roan. Which brings me back to the discussion about white Miniatures from a few days ago. 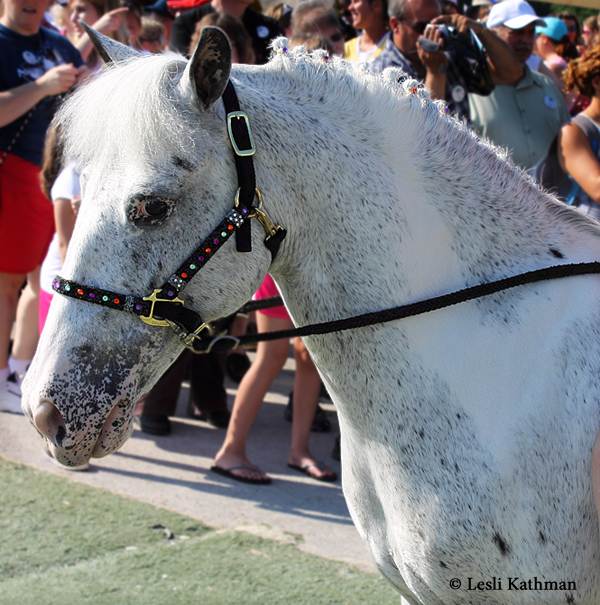 I truly did not think the colt in question was a Dominant White, but rather a tobiano that was rapidly greying out. 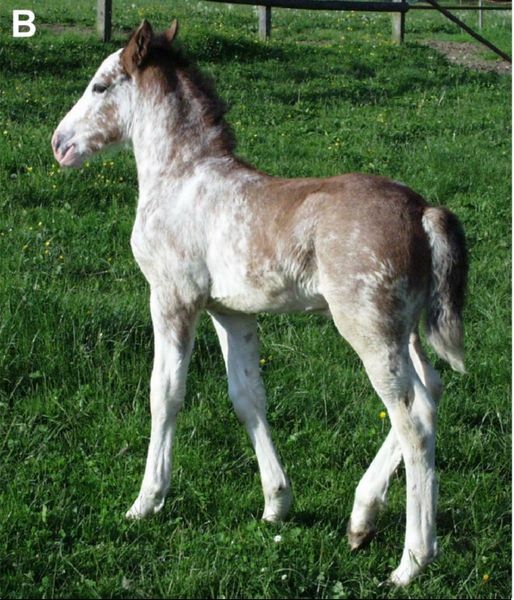 As a young foal, he looked like a chestnut tobiano. It did lead to the question, though, about what Dominant White might look like paired with tobiano. 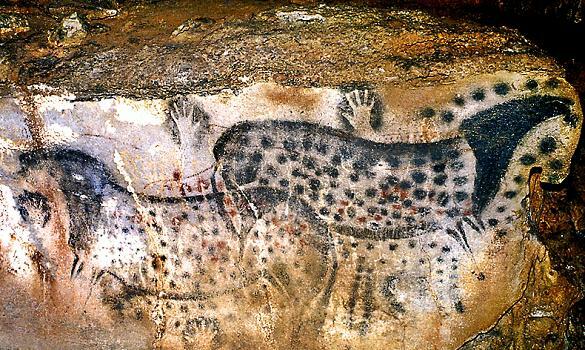 Would it overlap the pigmented areas (few though they might be in many cases), much like it did with the leopard above? 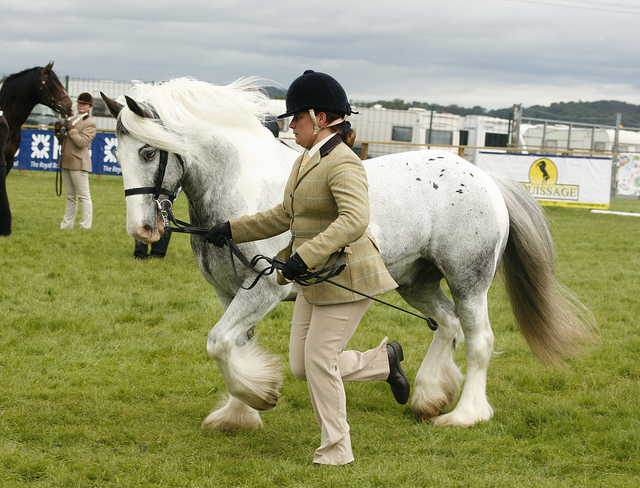 Or would the instructions to make the horse white override the tobiano patterning altogether? I suspect that the answer lies in the way the two patterns function at the molecular level. I enjoy reading papers about that aspect of genetics, but in many ways that is above my pay grade. As an artist, I am at heart someone who understands the nuances of phenotype (that is, how the horse looks) far more thoroughly than I understand the underlying mechanics. I will need to wait until someone crosses a Dominant White (particularly one of the families that tends towards the “leaky” variety rather than the all-white) with a tobiano to find out. A short time after the posts about Dominant White went out, I was contacted by someone about a family of seemingly white Miniatures. 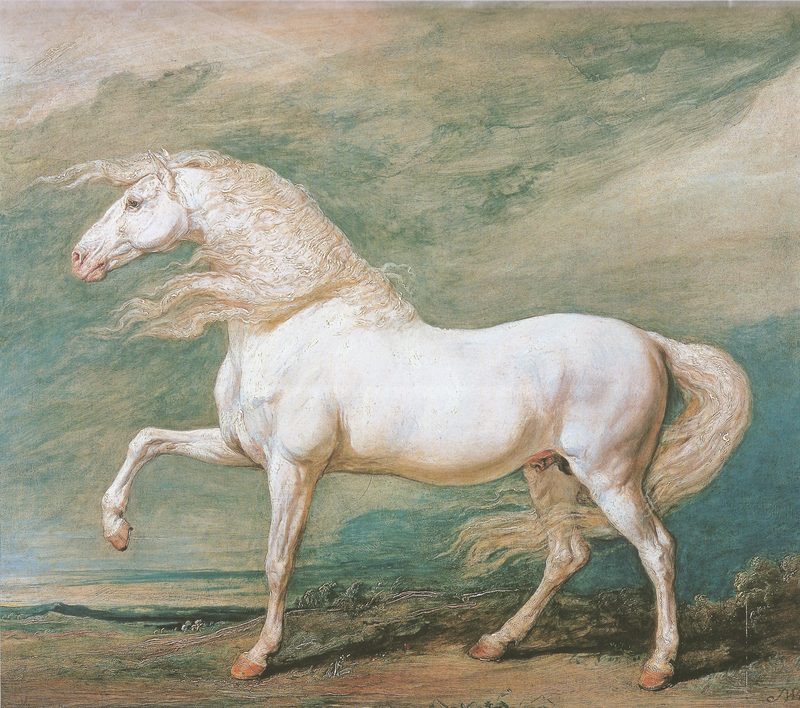 The stallion was advertised as a maximum white sabino, which is often how Dominant White horses are described. The writer wanted to know if I thought the horse was a White or a Sabino. She thought they might be Whites because of this quote from the Wikipedia entry about the color. 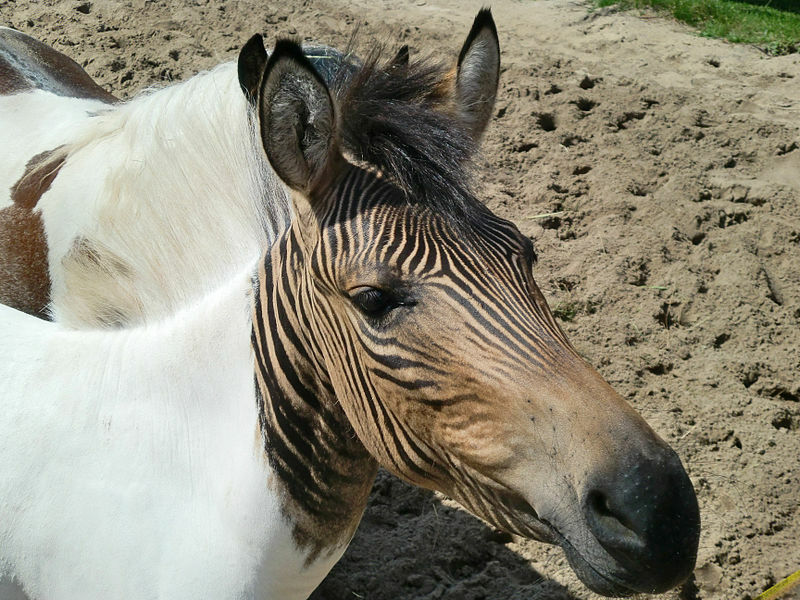 Horses with the W3 allele often retain interspersed flecks or regions of pigmented skin and hair, which may fade with time. 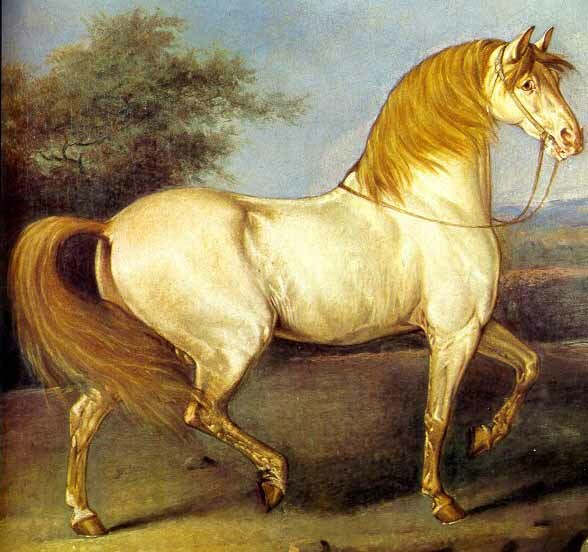 That quote was in reference to the third identified family of Dominant Whites, which began with the mutation in the Arabian stallion R Khasper. A few of the other Dominant White families – but not all – have this same tendency. Photos of the Freiberger horses in the original white study (W1, the Cigale family) show this phenomenon really well. Here is a Cigale descendant as a foal. Here he is as a mature horse. The writer wondered if the same thing was happening with the Miniatures. Looking at the pictures, it was clear that whatever else was going on with the stallion, he was a tobiano because he was throwing a lot of tobiano foals from unmarked mares. The fact that some of those tobiano foals turned white really quickly was why Dominant White was suspected. Because the dark areas of their tobiano patterns looked to have uniformly dark skin, my own suspicion was that the foals at least were not White, but early greys. Andrea Caudill sent the picture at the top of this post, and it is perhaps helpful in this case. 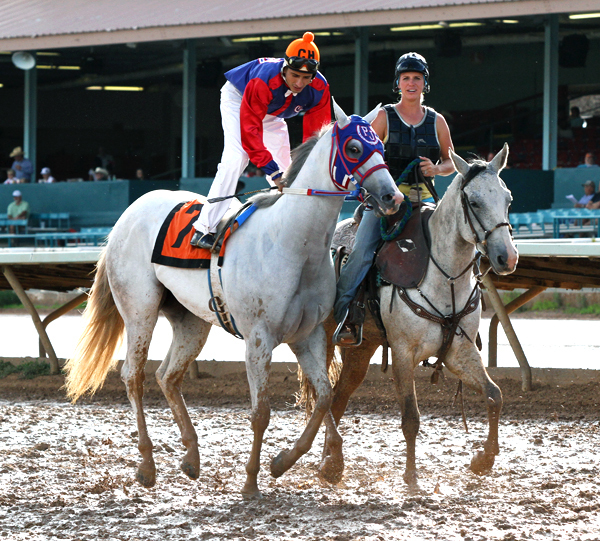 The colt is two years old, and almost entirely white grey. His legs are muddy in the photos, but Andrea says they were also white. As a thin-coated race horse in what is probably a wet environment, it’s easy to see his dark skin. In my experience, it can be much harder to tell white greys with extensive markings or facial depigmentation from truly white horses when they are dry and have denser coats. Some horses, like this colt, do grey really early. 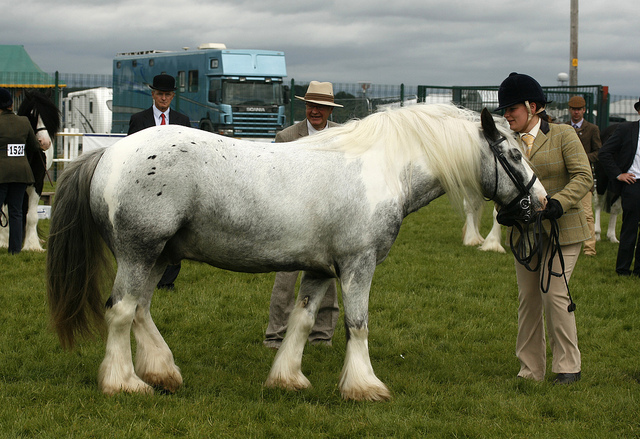 Famous white grey breeds like the Lipizzans and Kladrubers have been bred specifically for early and thorough greying. 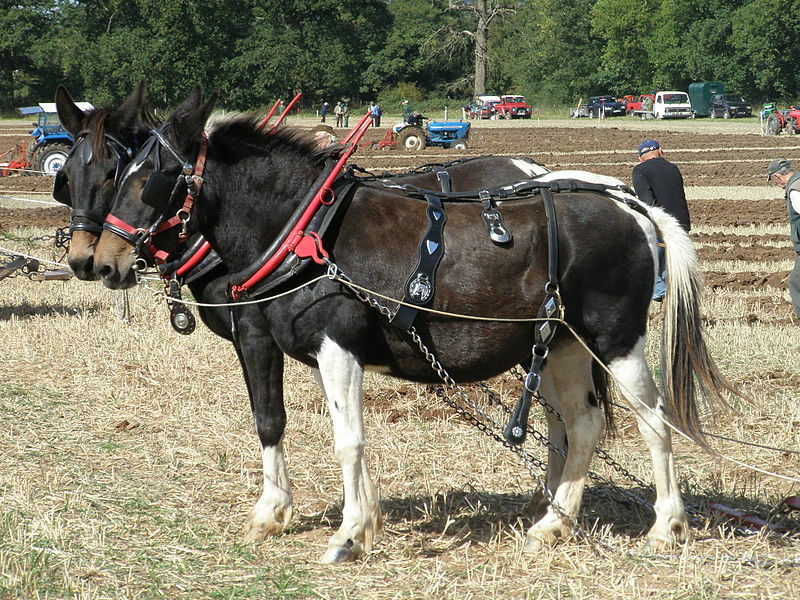 Conversely, breeds like the Percheron have been bred for later greying, so it would appear that greying speed can be manipulated by selective breeding. Perhaps even more interesting, and relevant to the situation with the Miniatures, is that early studies on the silver gene mentioned that pairing silver (Z) with grey (G) produced really rapid greying. 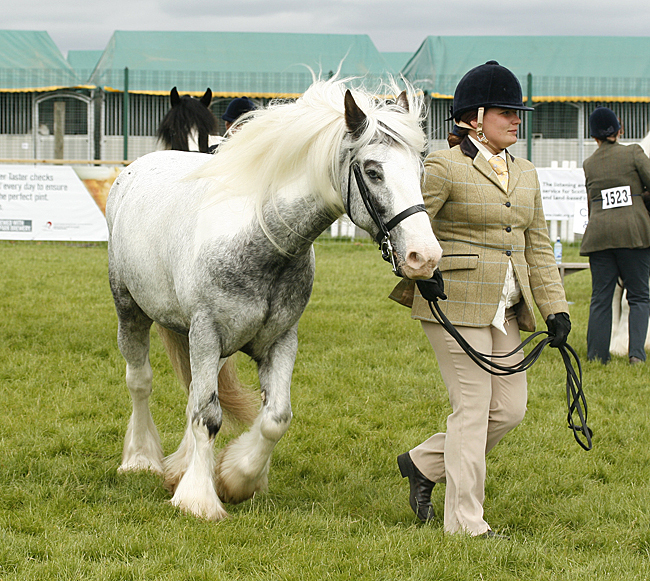 I do not believe this was studied in-depth, but it is true that a number of Shetland breeders in the mid-twentieth century were attempting to breed “white” ponies that were in fact early greys. That might be what was happening with the Miniatures in question. For the most part the upcoming book is about current breeds, but there were a few extinct ones that I couldn’t resist including because they were interesting in terms of color. One of those was the Royal Creams of Hanover. They are interesting because they were a remnant of the horses bred in the pre-stud book era, and also because their coloring remains a mystery. Were they double-diluted creams, champagnes or pearls – or something else entirely? I compiled as many accounts (and images) as I could and made some guesses in the book, but in fact no one really knows what they were. I suppose that is part of their allure for color researchers! Recently I found this photograph of the horses in a Library of Congress archive. 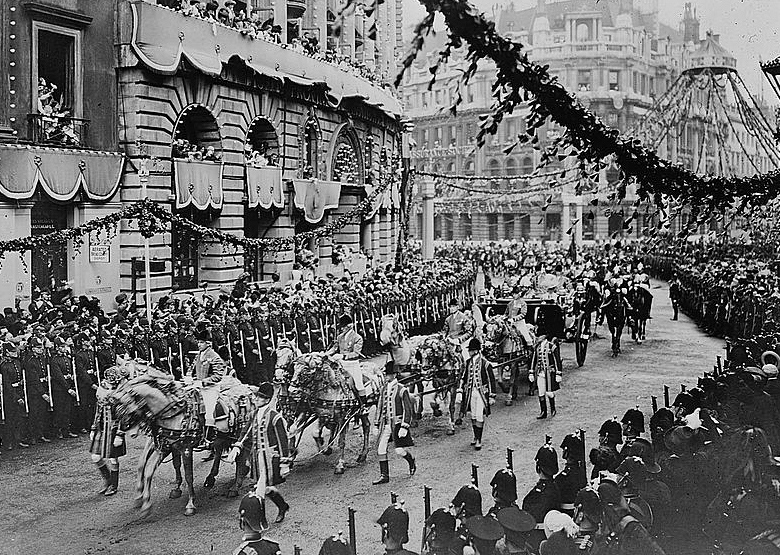 It was shot in London in June of 1911, so this would have been just shortly before the Crown Equerry determined that the remaining horses should be disbanded. The last of the Creams were dispersed in 1921, just ten years after the photo was taken. It was too late to include it in the section on the Creams, but I can share it here. Click here to send an email or photos. If sending pictures, please indicate if they are yours and if it is okay to share them on the blog.